Still dancing and more energetically than ever! Another good episode where the romance is now almost sparked, almost. What is certain is the Malaysian segment is over! We have been used, and used and used and then discarded. How I know? Ending… no brief intro anymore. 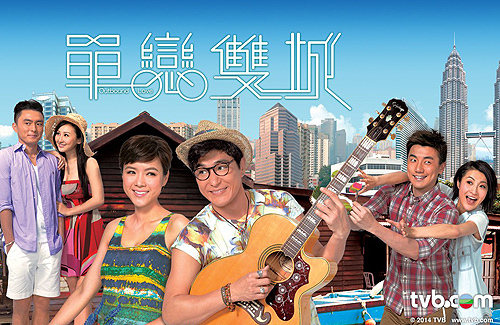 From episode 12 onwards, we are back in HK! But before I begin my recap proper, one last major scenic view seen here when Sik Sik and Ruco went fake dating was I was told the Chew Jetty (http://discoverpenang.evomediatech.com/chewjetty/). At least it’s in Penang. Since this will be what I think the last episode featuring Malaysian scenery, do check out the places featured in this series at the bottom of this recap. Also I must add whenever Ruco says he is not playful, etc, maybe it is true but that man is one big flirt! And I mean in a good way. He practically flirted with the Malaysian interviewer when he was teasing her in that Batu Caves BTS I saw on ASTRO. Poor girl was quite flustered. Sik Sik smiled as Ruco faced her glumly, and suddenly being self conscious he pulled down the piano cover, touched it briefly and looked at Sik Sik. Sik Sik smiled curiously as she said “I thought you said you can’t sing and you’re tone deaf. How come you can play my favourite song so well?” and can’t remember his exact reply except that he once played songs and that for a long time he never played any song due to heartbreak until someone new in his life changed his mind and made him play songs again and seriously he looked at Sik Sik intently and said “That person is you” and Sik Sik was shocked for a moment until Ruco smiled and became the playful self again and asked her how she felt when he said that? Was she moved? A bit attracted to him? Liked him? Well Ruco said he was quite touched by the elderly couple’s love story and who doesn’t want one love for a lifetime? But he didn’t believe that will be possible although Sik Sik thought she could never believe in one love one lifetime after what happened to her but after seeing the elderly couple she felt she could believe agin. He said cynically such doesn’t happen often and it is a rarity and he walked away as Sik Sik wondered what just happened. I can’t remember what exactly happened next so my recap from henceforth may be a bit jumbled up. Next thing they were walking side by side, Ruco was sullen, glum and deep in thought, unlike his usual self as Sik Sik stared at him hard as she walked side by side with him. Ruco suddenly looked at her and asked “Don’t you neck hurt, looking at me like that the whole time we were walking?” and Sik Sik looked at him harder and said “You’re like an onion” and Ruco asked curiously, “An onion?” and Sik Sik said “You have so many layers. I thought I figured you out, that I have peeled away your layers and yet there’s another layer, another part of you I am not able to figure out just yet”. GOOD!! Onion is good! Layers is very very good! Why? Now she is curious about him which means she will do something to earn his love. GOOD! Let’s move on shall we?! Back at the dorm and they saw a passed out Chin Chun and to skip the whole boring part, Ruco carried Chin Chun into his room whilst Sik Sik asked why Chun Chun never helped Chin Chun and she replied basically she didn’t she should bother but not so harshly. Fans of Ruco MUST watch this scene. Chun Chun opened his blurry eyes and first thing he saw was a guy mooning him. Yes ladies (and some gentlemen into this sort of thing), you will see Ruco in his underwear wiggling his but on your 100inch TV. No 100 inch? 30 inch also will have good view! Chin Chun shocked and shouted who the hell was that and we found out it was Ruco and Chin Chun shouted why he was in his room until Ruco corrected him that it was HIS room. Sik Sik entered with a glass of ginseng tea and Chin Chun was informed what happened and he panicked since he thought he said something inappropriate but was happy Sik Sik said he didn’t say anything much. And he rushed off to work. Ok here I shall just summarise because it is what I call “Useless to the plot scenes” scenes. Chin Chun found out Chun Chun recorded the entire confession and she used that to threaten Chin Chun to treat her better. How juvenile. Chin Chun sent virus to her phone but of course she backed up the video somewhere else. In the end Chun Chun said she will delete the video if and only if he helped her to win the local dessert competition so as to persuade her mom from bothering her, forcing her back to Canada and marry some silly looking mommy’s boy salmon supplier’s son. Chin Chun agrees. And I have saved you probably 20 minutes of “Useless to the plot scenes” scenes time. Here you can go and get your mandarin oranges, peel them as you savour the thought or even rewind that epic mooning scene in your 30inch TV. and someone please rip that scene so that I could download to my Ipad and rename it “Epic mooning scene”. In fact someone can upload to youtube and call it “Epic mooning scene” and dedicate it to all Ruco fans and inform every of the err… err… epic mooning scene. Have I emphasised my point too much? On that epic mooning scene? You know, that … epic… mooning.. scene? That comes with a wiggle too? Ruco asked Sik Sik to go fake dating with him so that he can have pictures to show to Chun Chun. or maybe he just wanted to have some Sik Sik time for himself even if he is trying to convince himself his heart is for-evah closed to love. Yeah right. If like that no love story lar! So there they were, at what I was told is Chew Jetty and taking some nice pictures with balloons. Then they passed another mural/street art and he asked her to take a picture and put her hand into some hole like how the painting depicting the boy doing the same thing and lo and behold, she touched something and it was a flower err head clip? The one we saw in episode 10 where she was with Ruco-Elvis in a shop. She knew Ruco was being nice (or romantic) by giving her a nice surprise and she was laughing happily. They has satay, each enjoyed coconut drinks and really wayyyyyyy to friendly with one another that any good friends ever had such business to be so darn close (Chin Chun, you are henceforth declared as NO CHANCE IN HELL AT ALL) when they saw Coconut Gangster and Ruco shielded Sik Sik and they were standing close together (I was told next to a mosque, not sure) and coconut gangster actually said “Young people these days! Eh, go get a room will ya young hotblooded people?” which was funny considering he almost molested poor Elaine some episodes ago and now suddenly full of morals. Anyway he left and what a perfect setting for them to look deeply into each other’s eyes as Sik Sik said “You can move away now” and Ruco said “What if I don’t want to?” and he moved closer to I suppose a kiss until she pushed him away. Was he seriously considering kissing her? Was he being playful? Was he just being a douchebag? After all he had said many times his heart is closed to the notion of love and yet here he was, his lips inches away from hers, wanting to kiss her. I am confused. Maybe she reminds him of his past love before she dumped him or something like that? I am still not convinced by this pair so please, maybe something more convincing rather than going through the motions? Anyway she suddenly saw Nic in a car and she became very sullen and glum and said she was tired and wanted to go home. Ruco thought she was upset because of him and so repeatedly asked her what’s her problem and she became the rude Sik Sik again. This series theorise that if you are in love with someone, you will be rude to them. Anyway she was exceedingly rude to him and he said he will be leading a group in KL for 3 days. And yes he said KL in higher pitch which bloody annoy me. and she wasn’t listening. Next thing she was speaking with Chun Chun who confirmed Nic was in Penang for 4 months for a project. And what does our Sik Sik do? Next day she handed her resignation to Yvonne and Sky eventhough both wanted her to stay. What a silly woman. So if Nic goes back to HK? She moves away? He is an architect. He can be any where. So where can she run to next? And within 3 days she has left for HK. And guess what? Chin Chun also resigned. WHAT?! And before she left she wanted to say goodbye to Ruco and Chun Chun asked why bother to say goodbye to the douchebag. Ahhhh love lost eh? It was 4th day and he should have been back but she couldn’t get him on the phone. Meanwhile Ruco received a call and was told to go back somewhere and so he left Penang. I suspect for HK. Because everyone goes back to HK. Like one tour group. Sik Sik arrived in HK and was greeted with a troubling scene; her sister’s boutique was actually failing, her bro in law’s career not doing so good and she did not wish to return to the tour agency. She also tried calling Ruco but still couldn’t get him and this time she was a little bit worried for him but left a perky message like she was back in HK and voluntarily gave him her HK number. Ahhhh love! LOVE!!! Meanwhile she went shopping and passed by a record store with her favourite song’s singer, that is played by Elaine Yiu. She entered the store and listened to yet again that awfully sung song, I believe called “I hate you”? “I want to hate you?” What’s the title? And as she was listening, Ruco passed by and yes he was in HK! He stopped to look at the gigantic poster of the singer and he looked sullen, glum, sad and last scene we see is both potential lovers side by side, separated by a wall, one enjoying the song, the other staring sadly into a poster. And I hope the story moves onto his heartbreak because if not we will never have a new pair and some drama and then the ending. I love Ruco’s story but I feel it is just too slow for my taste. BUT tonight’s episode is ok even if I was confused by Kung Tzi’s feelings for Sik Sik. Obviously Sik Sik is curious about Kung Tzi which is good but if Kung Tzi likes her, but not yet attracted to her why tease her so? Why almost kiss her? And how much should she run away from Nic? Is that the best excuse for showing how a character move from HK to Penang and back to HK? No other excuse? Ruco continues to dominate by alternating between playful/flirtatious/silly and serious/glum/sad/heartbroken. I like the latter better than the former. The latter speaks of volumes to a performance, the many layers as Sik Sik said of his Kung Tzi. The former is for laughs and a shield to what is inevitably the revealing of the real him. I am impatient in that respect and I hope the series moves on to the revealing. 11 episodes of enigma is enough. Now give me the romantic Ruco. Aimee also did well as the mature and more serious Sik Sik. Cute does her no good. I am however not liking her interpretation of her closeness of her Sik Sik with Kung Tzi, defined by how rude she is to him. Abusive if you ask me. But I like that scene where she stared at him hard. I don’t like her grabbing his coconut, literally. Am still annoyed with Lin Xiawei and her BB voice and now that silly storyline for her silly Chun Chun. We can do without her. Tony Hung can act and my god, he can be those sullen moody heroes. But again I dislike his Chin Chun. He should learn to either confess his love and grabbing Sik Sik and kissing her (like how Kung Tzi will do) or move on to the obvious woman for him, Chun Chun. And that way we can be done with him and his not very important character. No comment on other people except I shall miss Vivien Yeo’s ladylike gracious performance as Yvonne. Curiously how can Sik Sik call Yvonne her ladyboss.. Yvonne? Will you believe me if I said this episode is so easy to recap? Not because I hated it but because I liked him. I find recapping easier now that we have something going on and everyone grows up and stops being silly, dumb or cute. Yeah! Let’s dance together in celebration!! BYE BYE MALAYSIA!! HELLO HK!!! Focusing on the Malaysian scenery. Correct me if I am wrong. Aimee Chan is really NOT pretty and she is a bad actor. This series is sorta of boring and crap. I just starting watching You Who Came From the Stars.Jun Ji-hyun so 예쁜.I noticed she also cross eyed as well. Not awwww moment because his next reply was very cynical. Quite a sad moment. No doubt about it, Luk Kung Zi is obviously interested in Sik Sik (for whatever reason only he knows cos i don’t think Sik Sik is likeable either). In fact i wld say that he felt attraction for her since the first time he saw her at the autograph signing session of Elaine’s character, hence he remembered her as a face he had seen before when they met again in Penang. One part of him wants to confess to her but the other part of him is holding him back. Hence we see him confessing that Sik Sik is the only person who makes him want to play the piano again, then in the next breath, he claimed that he was kidding her. He wld have kissed her later in the coconut scene but she resisted and kicked him in the shin. i know what you mean. On the other hand, i can only see Aimee, Mrs Moses Chan, not Sik Sik. Do people in Penang really wear the clothes that Luk Kung Tzi wears in this series?? Sorry, but his outfits look hideous!! Other than the clothes, I think Ruco is brilliant in this series. He is a very good actor and I hope TVB will continue to give him plenty of opportunity. In contrast, Aimee’s performance is a bit underwhelming. She needs to work on her Cantonese a bit more. I do think she has given the role her best shot but unfortunately, her acting skill has quite a bit of room for improvement. I don’t think nowadays Penang ppl will wear as Kung Tzi. I guess, it is more on a way used to differentiate HK and Malaysian style. I guess the Malaysian segments are not over yet, there should be some towards the end of this series. Elaine Yiu did come for shooting in Penang but we have yet to see her until the latest episode.